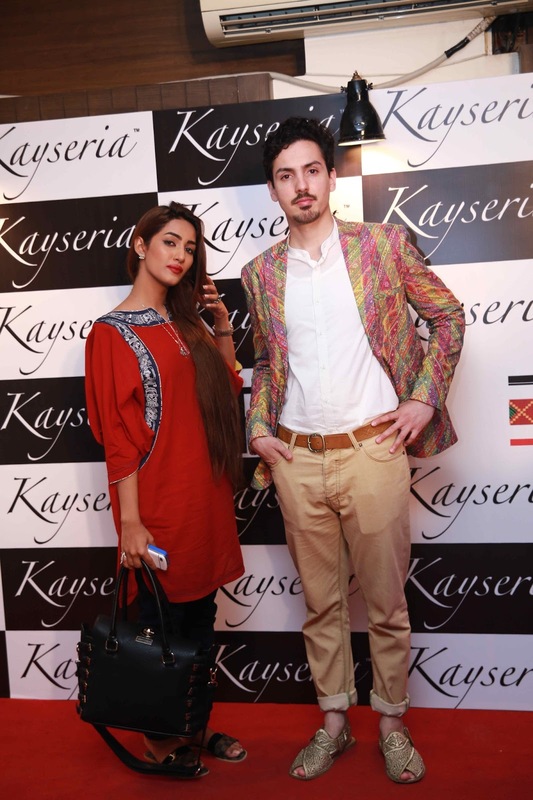 I was right on time for the much awaited Kayseria Pret Launch. Since I saw the sneak peak at the PFDC Sunsilk Fashion week I have been waiting for the collection to be available in stores. I was delighted to receive the invite and got done early from work to make sure I am not late (which I usually am sometimes due to overworking). 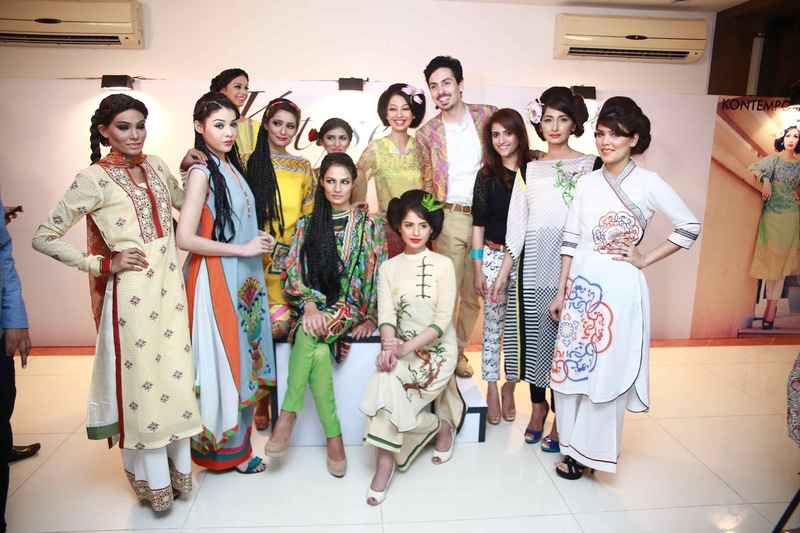 The Launch took place in the basement of the Olivetto Restaurant in Clifton, Karachi. The invite said there will be iftar so I assumed that the restaurant on the above floor was booked. I was wrong. The set up was in the same space. I doubted the decision which was proved to be right later. The overall set up was basic. 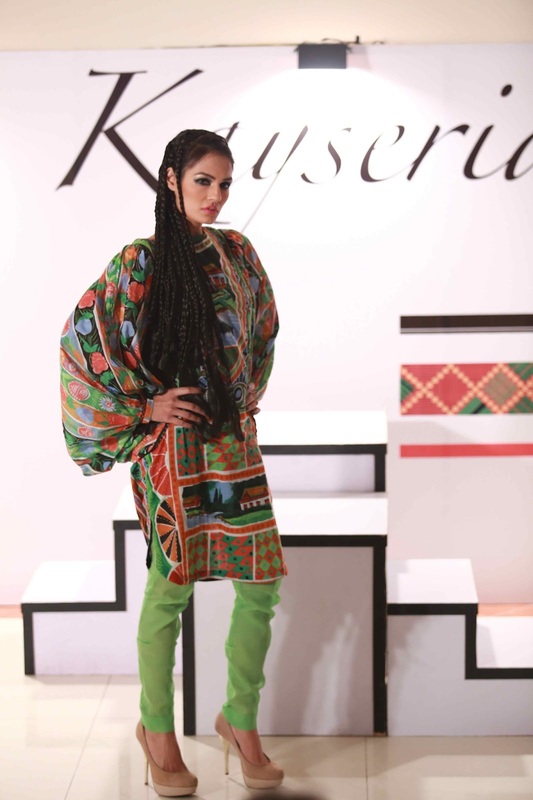 I liked the full size Kayseria Pret Collection images as backdrops. Lighting could have been better but didn't kill the atmosphere. 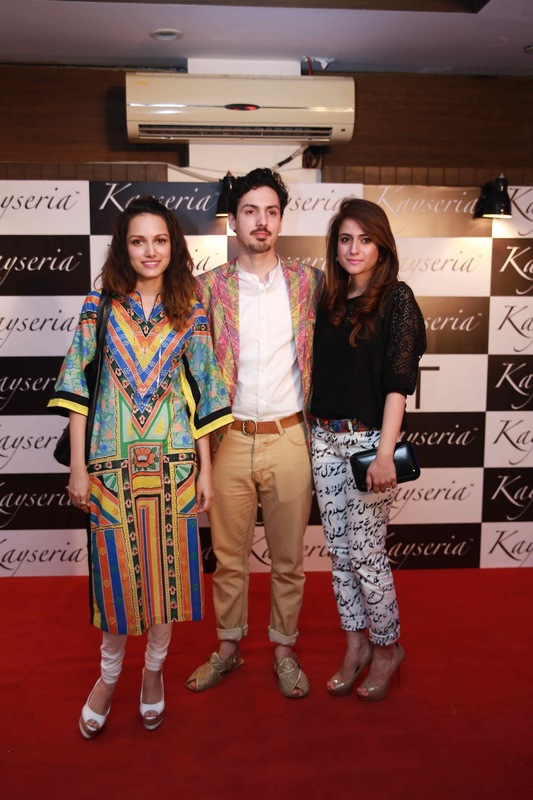 If it wasn't for my admiration for Kayseria and their sweet management I would have walked out. I am glad I stayed. 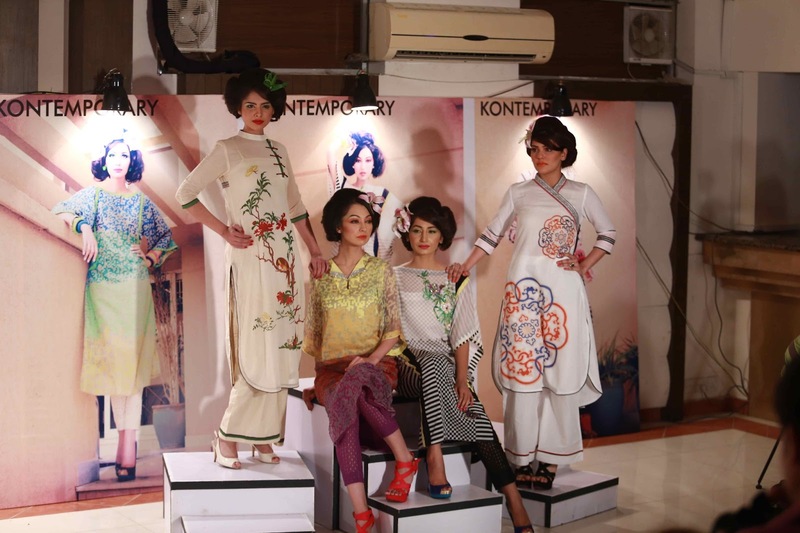 The presentation started with their Kontemporary line, followed by Riwayat and closing with Virsa. Kotemporary is exactly what the name suggests. Modern, straight silhouettes with fluorescent and neon palette, softer canvas of hand printed chiffon and cotton fabric. 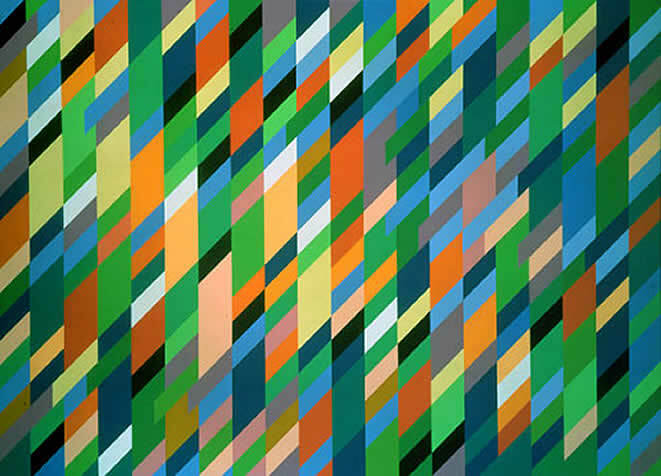 The collection is inspired by the art of Bridget Riley & Box Barcode elements, a great mix. It screams 'I am the Confident, trendy woman of today'. 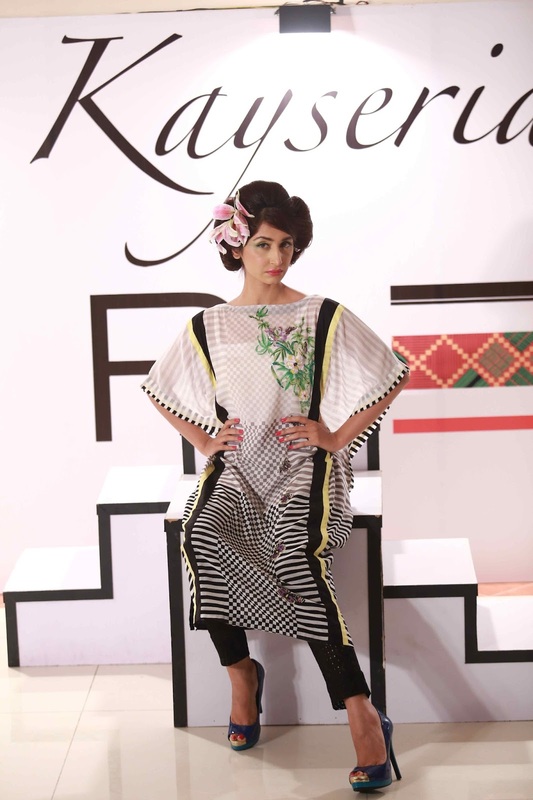 Riwayat was more traditional with classic flowy cuts and embroidery and prints inspired by the elaborate culture of the sub continent. Though not my cup of tea, the collection was rather elegant and a ideal for the sophisticated women of today who want to stand out. The presentation was short and sweet. I do wish that the selection of models was a little better. Other than Rubya, Hira, Fauzia, Tatmaeen and Abeer the rest were a bit of a Misfit thought the makeup and clothes did their best to cover that up. 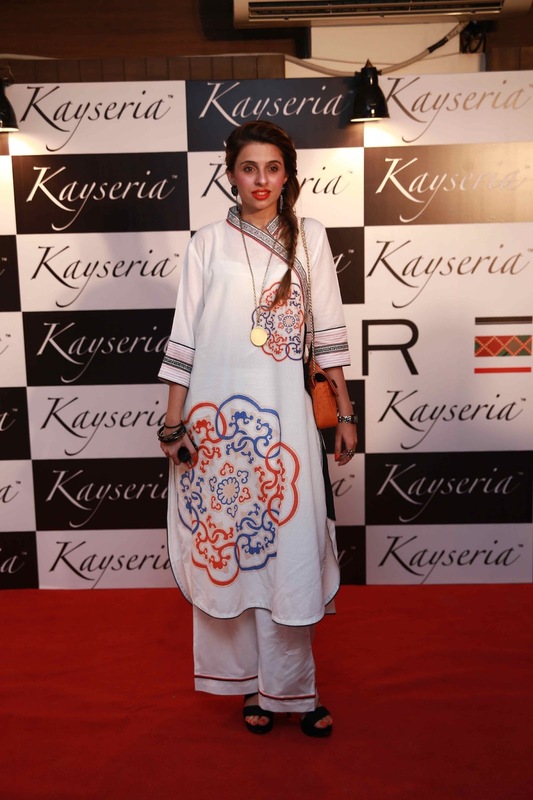 Kayseria Pret was also spotted amogsnt the attending guest and celebrities. 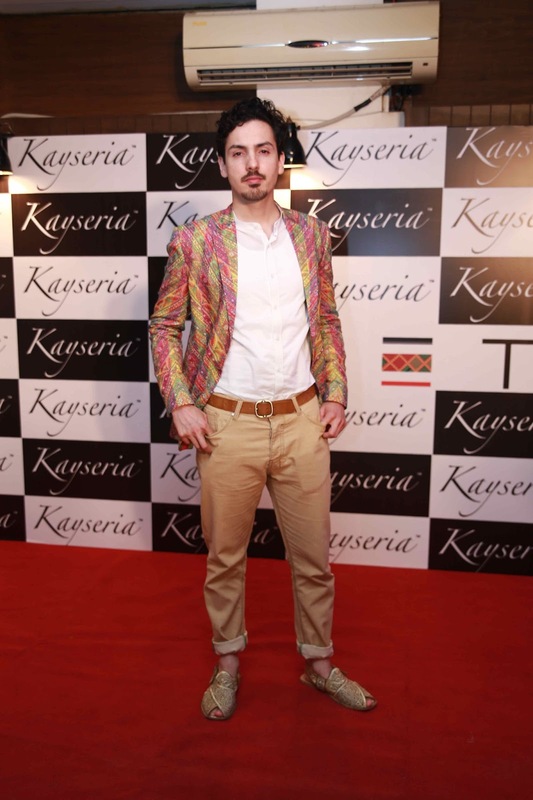 I really like How the creative Director of Kayseria Waleed Zaman gives a bit of Sneak Peak on whats next or whats trending in the world of Kayseria. The Jacket he was sporting was something almost everyone was eyeing that evening. I was already impressed by how he pulls off trends an ordinary men fears with such pzazz (lets not forget how amazing he looked in those neon pants he wore every day during PFDC Sunsilk Fashion week earlier this year). Hats off to him for being an inspiration to the metro-sexual men of Pakistan. I must also add he is one of the most polite and down to earth people I have come across. 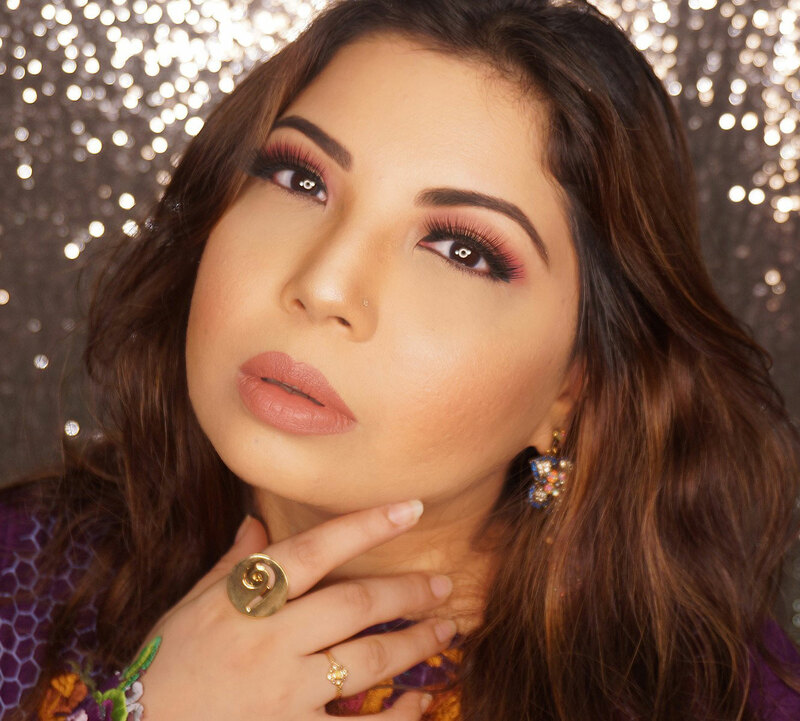 The Even Management was by Catalyst PR & Marketing and the Makeup was done by Sabs Salon. I agree with you honey Waleed Zaman is one of the most humble persons I have ever met.